Today I joined the recently formed Redcliffe Tree Society beside Moreton Bay. We met at Prince Edward Parade to admire the ‘Cathedral Fig Walk’ of native fig trees (Ficus benjamina) planted over half a century ago by (now former) Redcliffe council. The effect of the planting has been to create a green roof, a double avenue of evergreen fig trees. This created a lush, leafy street. Tree canopies have become interlinked into one massive, green mosaic. As a consequence, these trees have made this location a more desirable place to live, and a more habitable place for a home. Residents won’t have to worry as much about air-conditioning bills as people living in hotter, less well ‘treed’ streets. Thanks to these living air conditioners, it’s up to 7C cooler in their shade. When times are sticky, bring your deckchair, and chill. Maybe one day there will be benches for visitors. When first I heard about this double avenue of Ficus benjamina, I pictured massive trees. Instead they are quite compact. This, I believe, is for two reasons. The street, the paving and generally tough growing conditions have somewhat tamed these forest trees. Second, they were once regularly lopped and this further limited branch and root growth. If I had chosen a species of fig to plant as a double avenue, I would have gone for White fig, Ficus virens. This native is semi-deciduous. When I worked at Sydney Botanic Gardens we chose this species to replace the declining evergreen Moreton Bay fig trees (Ficus macrophylla) that lined Hospital Road in the Sydney Domain. When White figs shed their leaves in spring, they also ditch the debilitating, sap-sucking pests, especially psyllids, living on them. Psyllids plagued the Moreton Bay figs along Hospital Road, hastening their demise. Should Moreton Bay Regional Council adopt a long term conservation plan for this fig avenue, I would suggest filling gaps with White fig – a successional species. What else makes this avenue a valuable community asset? Coastal tree plantings shelter adjacent properties from gales sweeping across Moreton Bay. As with all plants, leaves soak up atmospheric CO2 and, through photosynthesis, create their own energy and store carbon in their tissue as they grow. Atmospheric carbon becomes terrestrial wood. Many studies have shown that plant foliage mitigates traffic pollution (city air) and that tree canopies capture lots of rain, reducing stormwater flows. Plant roots also capture nutrients and silt, improving stormwater quality. In this slice of Redcliffe less pollution is entering the seagrass meadows of Moreton Bay Marine Park, a site of special scientific interest for birds and dugongs. Probably the most vital study taken to evaluate to economic and environmental benefits of urban forests was ‘The Benefits of Trees’ undertaken by the City of Boulder, Colorado (USA). That region is less than a quarter of the size and population of the Moreton Bay Regional Council. “Trees live and provide benefits well beyond one human lifespan…all of the above plus habitat, traffic calming, human health benefits, wind dissipation, connection to landscape history and all of the personal connections and stories that are attached to each tree”. I’d love to see this avenue of trees with a sign explaining the cultural significance of these veteran trees to residents and tourists. How fortunate that these trees are not quite middle aged. There’s even space to extend this avenue into adjacent Grant Park, and if the bee-killing, weedy, suckering, seeding African Tulip tree (Spathodea campanulata) were grubbed out, there would be even more plantable spaces. 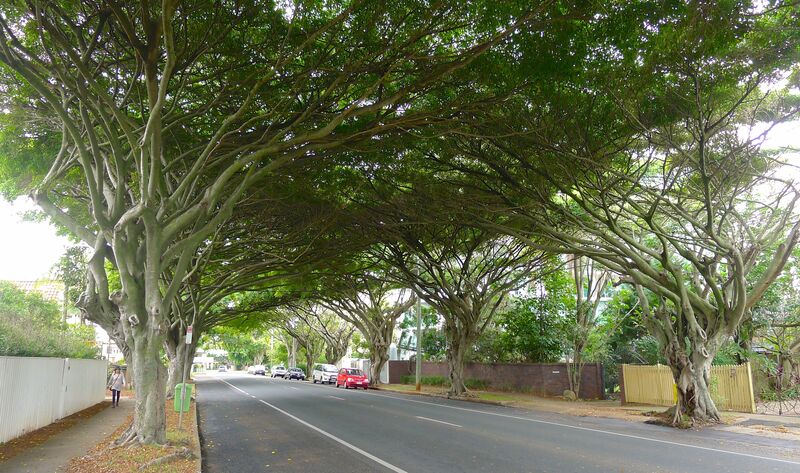 With regular health checks, and a little TLC, Prince Edward Parade’s ‘Cathedral Fig Walk’ could well cool and shelter the next generation. My best wishes to Moreton Bay Regional Council. “I only recently moved off Prince Edward Pde after living there for 12 years with my daughter. We did & still do love walking the fabulous fig stretch you’ve just visited Jerry. It has several side streets that also have some great examples of treelined blocks/ avenues I hope you got to check out too. The regular lopping to avoid issues with power lines have definitely assisted with their size. And their roots overall have not been too invasive considering the size and destruction they could have caused. As Jerry has said in this circumstance the pavement & bitumen have luckily for council curtailed potential problems”. “Thank you so much for taking your precious time to come and look at the trees and share your expertise. It was so fantastic and deeply appreciated”. “Agree wholeheartedly Annemarie Butler! What an inspiring interview”. “I know these trees – they’re planted on the Goldcoast, too – gorgeous things”. Hi Jerry, nice piece on the Ficus benjamina avenue at Redcliffe. There are always so many points of view to consider when making comment on such a highly political topic. I am not so sure that the residents of Redcliffe parade themselves are so keen to see members of the Ficus genus used along their street. I like your idea for Grant St and Grant park although I believe Tipuana tipu rather than African tulip trees make up most of the Grant St street scape. In my experience as a manager of urban forests in Europe and Australia, there will always be characters who moan about every leaf falling onto their property. Don’t forget some residents are apartment dwellers, they look down into those special trees. Residents living in houses adjoining the fig avenue also grow trees, I noted the presence of mature forest trees, the message seems to be residents enjoy their treescape. The Tipuana tipu – invasive weeds – are another story, a separate management issue on Grant Street, not Prince Edward Parade. Thanks for this interesting story and the photographs Jerry. I grew up in Sydney and remember many trips to the beautiful Botanic Gardens as well as walking through the Domain. Eighteen months ago I moved from acreage with towering gums and singing casuarina forests to an unloved Brisbane inner suburban block that included madeira vine, Celtis sinensis and Schinus terebinthifolius as well as the prickly Asparagus africanus which I have gradually removed. I am surrounded by elderly neighbours who can no longer garden. They are enjoying my newly growing forest of native scrubs and trees including the beautiful Buckinghamia celsissima. The birds, bees and butterflies as well as lizards and worms are returning. My neighbours appreciate the transformation since they cannot manage a garden anymore. It brings tears to my eyes to see the movement and colour in a space that was previously bare and uncared for. What a deliciously and elegant response and advice to your visit to Prince Edward Parade. “Cathedral Fig Walk” we will hang on to that. Also thanks for advice on white figs, and your measured response that also recognised Councils management dilemma and experience with similar situations. There will always be those who detest the very smallest leaf that dares invade the ‘sovereign territory’ of home. Whilst employed in arboricultural services by various local councils I’ve had to deal with anti-tree councillors. Amazing, but they still exist. It’s important to understand councils have legal obligations. Independent advice and second opinions by experienced experts should be part of the mix if ‘safety’ or ‘unduly high maintenance’ costs are raised as a mechanism to remove sound trees. On several occasions I have used records to defend my employer from prosecution, and to require staff and contractors to demonstrate value for money. Proactive councils always keep records of money spent on trees. Wise councils keep long term individual records on trees. Jerry your visit and comments are appreciated. I’m sure all those in attendance have some food for thought. I’m sure the MBRC will rethink removal of 7 of these trees. They may not be the best footpath tree but they are now part of Redcliffe and should be cared for by the Council more rather than REMOVED. If council could be persuaded to return to cyclical pruning, this would enhance their heritage, ecological and amenity value.